In studies of coordination dynamics, behavioral coordination has proven a rich entry point for uncovering principles and mechanisms of human action [46, 104]. 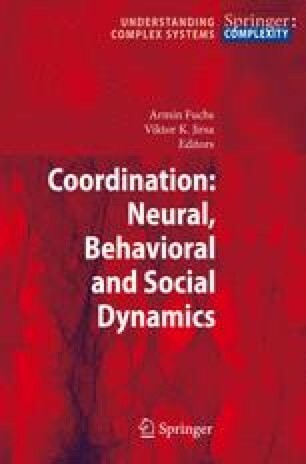 Within this conceptual and theoretical framework, coordination is defined in terms of collective (or coordination) variables that specify the spatiotemporal ordering between component parts. In the vicinity of critical points, emergent behavior is governed by the low-dimensional dynamics of these collective variables . Seminal studies of motor coordination conducted in the late 1970s used nonlinear dynamics as a framework to underst and bimanual coordination [44, 45, 52, 56]. The influential results of this work demonstrated the self-organized nature of coordinated rhythmic behavior by showing that the global pattern generated by the combined movement of individual fingers is captured at the collective level by the value of an order parameter that, in this and many cases, turns out to be the relative phase between the coordinated elements. The low-dimensional dynamics of this self-organized system is revealed via manipulating a nonspecific parameter referred to as control parameter that guides the system through its various states without directly specifying those states. A quantitative change of the control parameter gives rise to a qualitative change of the order parameter via a nonequilibrium phase transition . Such transitions, together with other key features, including critical slowing down and multi-stability, are classic hallmarks of self-organizing systems .